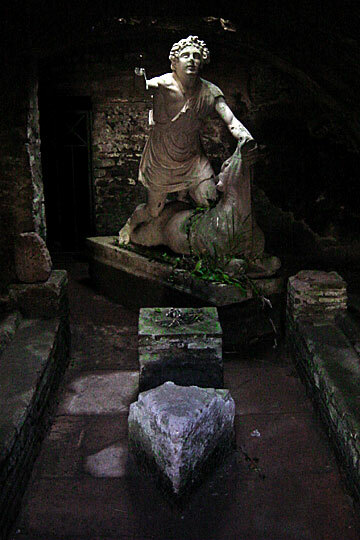 Tauroctony of the Mitreo delle terme di Mitra – Mithraeum. Our Common Sun. Large marble statue placed on a base underneath one of the funnels. A very exceptional representation of Mithras as a bullkiller. The young god, only clad in a short tunica, which covers half of his chest, grasps the bull with his l.h. underneath his mouth and triumphantly raises the r.h. with the dagger. He forces the animal down with his knees. The sheath of the dagger is fixed on his belt. The god raises his curly head with pathetic expression towards the sky. On the base crals the snake. No scorpion. On the bull's chest an inscription No. 231. Lost: part of the dagger; parts of the bull's forelegs and tail. Mithras' head and arms, the bull's head and parts of its knees and tail already in antiquity had been repaired in a grayish marble. Thus the Mithraists repaired and used an older statue, the date of which is the second century A.D.